Originally developed as research tools for use in structure–activity relationship studies, synthetic cannabinoids contributed to significant scientific advances in the cannabinoid field. Unfortunately, a subset of these compounds was diverted for recreational use beginning in the early 2000s. As these compounds were banned, they were replaced with additional synthetic cannabinoids with increasingly diverse chemical structures. This chapter focuses on integration of recent results with those covered in previous reviews. Whereas most of the early compounds were derived from the prototypic naphthoylindole JWH-018, currently popular synthetic cannabinoids include tetramethylcyclopropyl ketones and indazole-derived cannabinoids (e.g., AB-PINACA, AB-CHMINACA). 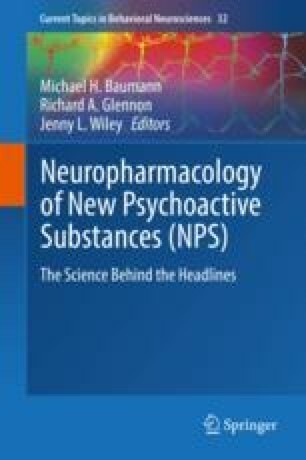 Despite their structural differences, psychoactive synthetic cannabinoids bind with high affinity to CB1 receptors in the brain and, when tested, have been shown to activate these receptors and to produce a characteristic profile of effects, including suppression of locomotor activity, antinociception, hypothermia, and catalepsy, as well as Δ9-tetrahydrocannabinol (THC)-like discriminative stimulus effects in mice. When they have been tested, synthetic cannabinoids are often found to be more efficacious at activation of the CB1 receptor and more potent in vivo. Further, their chemical alteration by thermolysis during use and their uncertain stability and purity may result in exposure to degradants that differ from the parent compound contained in the original product. Consequently, while their intoxicant effects may be similar to those of THC, use of synthetic cannabinoids may be accompanied by unpredicted, and sometimes harmful, effects. Preparation of this review was supported in part by National Institute on Drug Abuse grant DA-003672; NIDA had no further role in the writing of the review or in the decision to submit the paper for publication.